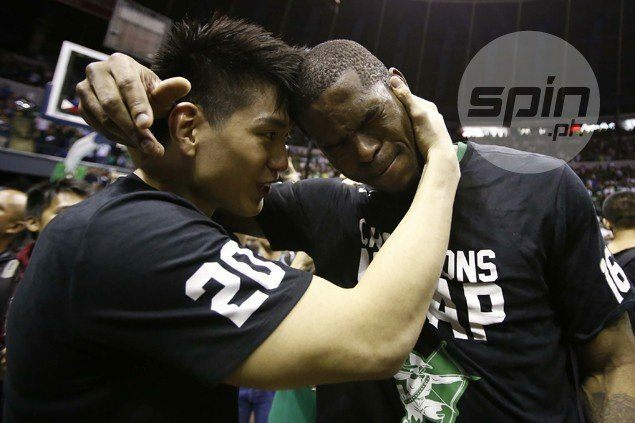 JERON Teng and Ben Mbala lead the top bets for the Smart Player of the Year award to highlight the gathering of the best and brightest in the Collegiate Basketball Awards set Thursday at the Montgomery Place Social Hall in E. Rodriguez Ave., Quezon City. Joining the La Salle duo as candidates for the prestigious award are the other members of the Mighty Sports Mythical Five in Arellano University's Jio Jalalon, San Beda's Javee Mocon and Mapua's Allwell Oraeme. The award is one of many that will be handed in the event backed by Smart, Accel, Mighty Sports, MJM Productions and Chooks to Go and hosted by 2016 Mutya ng Pilipinas Asia Pacific International and Far Eastern University courtside reporter Ganiel Krishnan. Also to be recognized are Aldin Ayo and Jamike Jarin with the Coach of the Year honors for guiding La Salle and San Beda to the championship of the UAAP and NCAA, respectively. Ayo will make history as the first coach to win the UAAP and NCAA Coach of the Year in the awards night held every year by scribes covering the collegiate beat. Jarin, now with National University, is a first-time winner of the award after leading San Beda to its ninth championship in 11 seasons. Also to be cited are La Salle's Kib Montalbo and San Beda's Davon Potts with the Pivotal Player for their major roles in the championship run of their teams. University of the Philippines guard Jett Manuel and Far Eastern University forward Raymar Jose are going to be handed the Super Senior award for their impressive performances in their final collegiate seasons. Adamson center Papi Sarr will be receiving the Mr. Efficiency award while UP guard Paul Desiderio is the Chooks to Go Breakout Player.